This contemporary kitchen in Pasadena, TX features crisp, clean lines and spectacular lighting effects that are warm and inviting. While this kitchen is visually stunning, it is also highly efficient and functional. The high-end lighting package features a stunning multi-color “light show” in the skylight shaft. 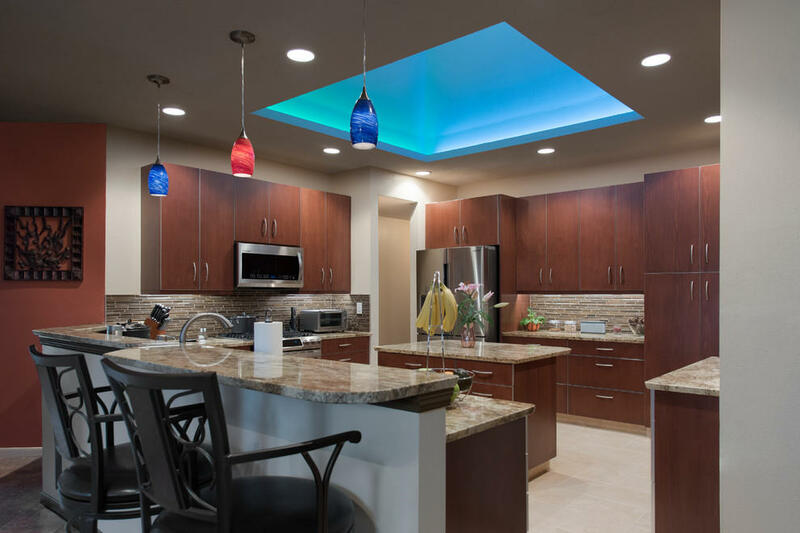 Crisp clean lines and warm colors come alive with the stunning LED multi-color light display up in the skylight. The colors up in the skylight are ever-changing from one soft color to another. Brookhaven custom cabinets by Wood-Mode offer an abundance of storage amenities and sleek contemporary styling. The rich stained maple cabinet doors with aluminum edge-banding offer a unique option to ordinary slab doors & drawers. 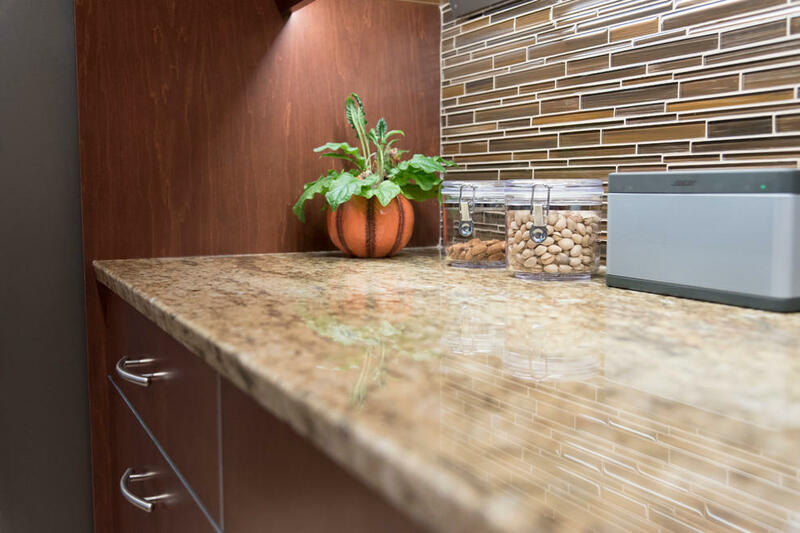 LED can lights and LED under-cabinet strips illuminate the kitchen, and clean, clutter-free backsplashes are made possible with the use of angled power strips below the upper cabinets. 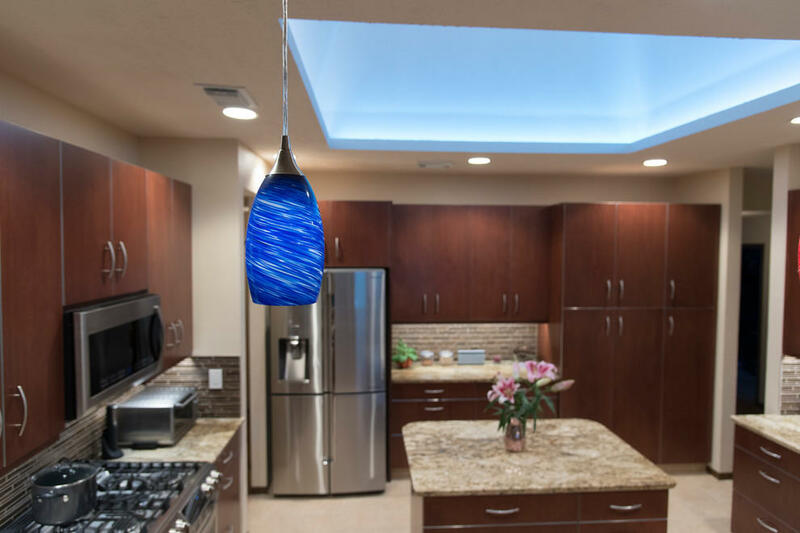 Crisp clean lines and warm colors come alive with the stunning LED color light display up in the skylight. The colors up in the skylight are ever-changing from one soft color to another. Brookhaven custom cabinets by Wood-Mode offer an abundance of storage amenities and sleek contemporary styling. The rich stained maple cabinet doors with aluminum edge-banding offer a unique option to ordinary slab doors & drawers. 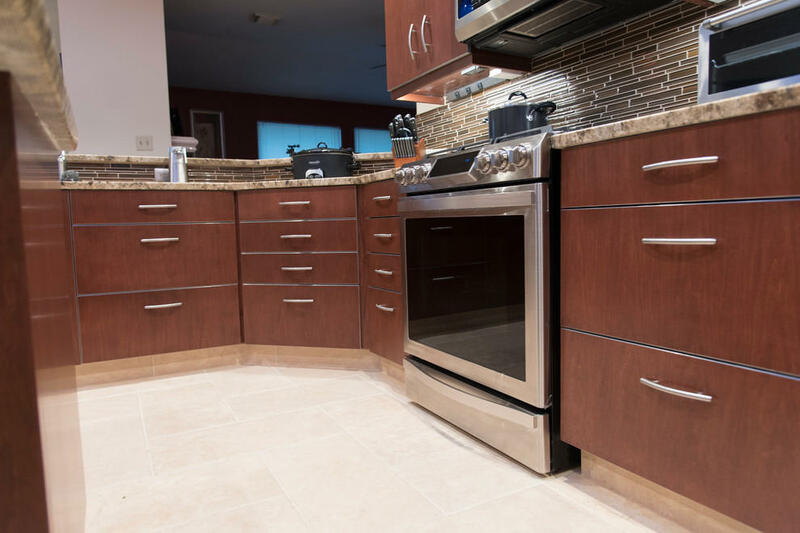 LED can lights and LED under-cabinet strips illuminate the kitchen, and clean, clutter-free backsplashes are made possible with the use of angled power strips below the upper cabinets. Crisp clean lines and warm colors come alive with the layered lighting package. Brookhaven custom cabinets by Wood-Mode offer an abundance of storage amenities and sleek contemporary styling featuring grain-matched drawers & doors. The rich stained maple cabinet doors with aluminum edge-banding offer a unique option to ordinary slab doors & drawers. 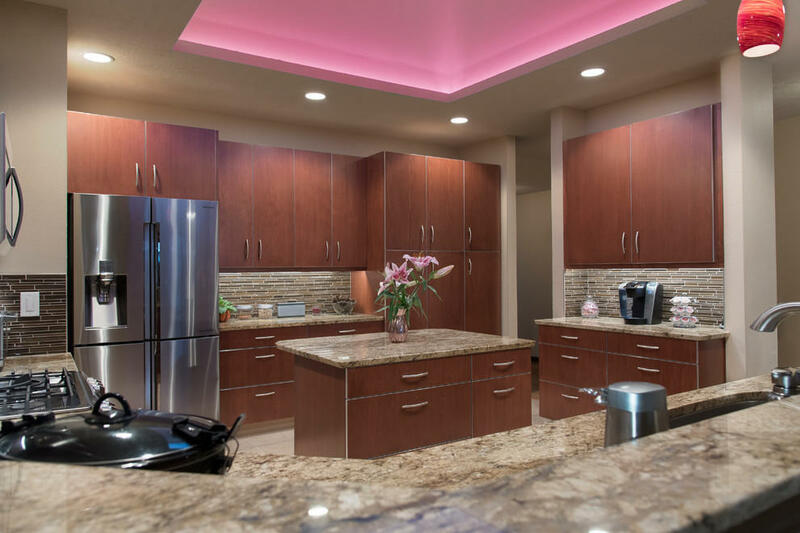 LED can lights and LED under-cabinet strips illuminate the kitchen, and clean, clutter-free backsplashes are made possible with the use of angled power strips below the upper cabinets. 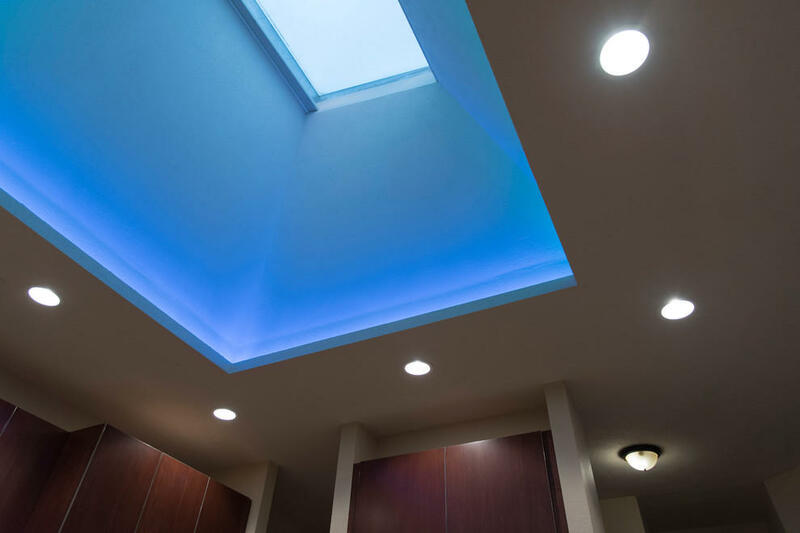 Crisp clean lines and warm colors come alive with the stunning LED color light display up in the skylight. The colors up in the skylight are ever-changing from one soft color to another. 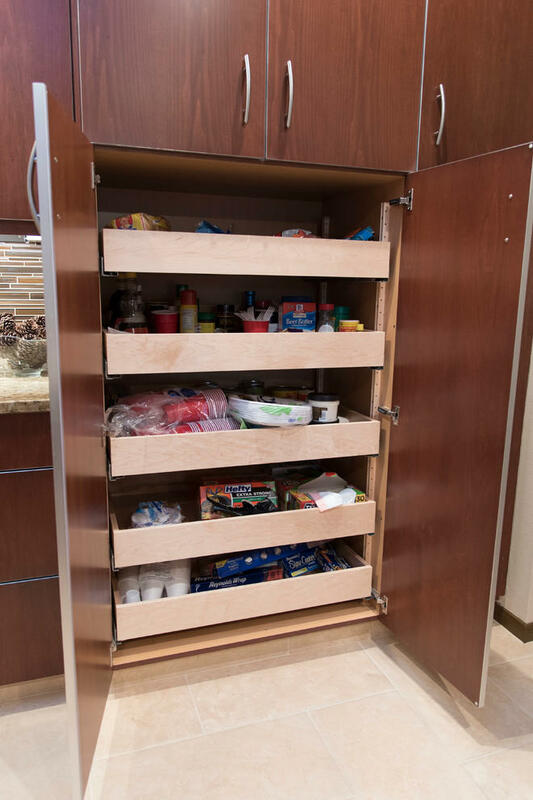 These roll-out shelves in the tall pantry offer maximum efficiency for storage, accessibility and flexibility. 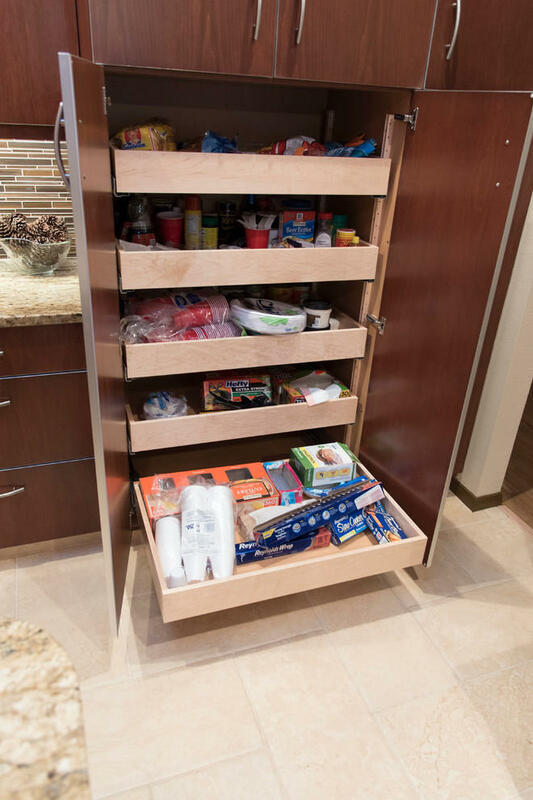 These roll-out shelves in the tall pantry offer maximum efficiency for storage, accessibility and flexibility. Each roll-out shelf is fully adjustable and full-extension.